A MAZE attraction in the Lake District is on track to reach record heights this summer thanks to the recent spell of hot and dry weather conditions. 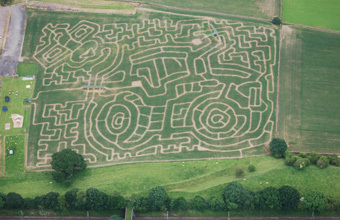 The Lakeland Maize Maze near Kendal had already grown by around two feet in just over a week after the new maze design for this summer was first cut out by farmer, Graham Wadsworth on Friday July 5. Last year's maze only just managed to hit the six-foot mark over the course of the entire summer but this year's is expected to eclipse that before the end of July if the current temperatures hold. Graham said: "It really is quite astonishing how quickly it's come on in just a few days. This is the ninth year we've been planting a maze on this site and I've never seen anything like it. If it carries on at this rate, it could reach 10 feet!"